The study of UFOs, for the most part, is concomitant with the alleged presence of intelligent alien life visiting planet Earth. Ever since the late 1940s, when strange and highly-advanced aircraft began to appear that was unrecognizable to a majority of our military institutions in countries around the world, members of the scientific community and intelligence agencies that were bold enough to embrace the serious study of such as-yet unexplained phenomena were forced, partially for lack of any justifiable proof to the contrary, to consider whether some of the UFOs being witnessed might actually represent alien intelligence from other worlds. Probability, on the other hand, would likely favor a terrestrial origin for the majority of our unexplained aerial phenomenon that remains unaccounted for in any official capacity. After all, while the possibility of alien life does exist, the lack of any physical evidence for this forces those of us bound to the often harsh scrutiny of scientific methodology to accept that in the lack of any such evidence, this may not be the likeliest solution to the UFO problem. Are you planning to have any guest speakers on your upcoming podcast? And might the subject of OWLS be on the docket? My take on this? The “clowniness” or trickster element in UFO and paranormal reports may simply be a misapprehension on our part. The element left out here from the “Magonia” hypothesis is the way in which the phenomenon seems to “change” in accordance with human belief systems. During the 50s UFOs claimed to have come from “Venus” and the technology noted in contact cases seemed to adhere to the flashing-light, analog dial and vacuum tube variety that was the prevalent “high-tech” during that era. My feeling is that the “trickster” factor may not be an element of the “other” at all but, rather, may be how our human belief systems shape what we experience. How else can we explain the “airship” phenomenon of the 1890s? The ships described often adhered to a peculiarly Victorian kind of “high tech” of the boiler plate and propellor shaft variety popularized by Jules Verne and returning to us in our day in the “steam-punk” fad. It may not be the “others” playing tricks on us at all. It may be our own belief systems actively shaping a phenomenon whose ontological status may not directly translate to our limited material world, and more importantly, our limited human concepts of “reality” that we believe to be deterministic. This then, may represent a quantum shaping of human experience manifesting from the detritus of our Jungian collective consciousness. 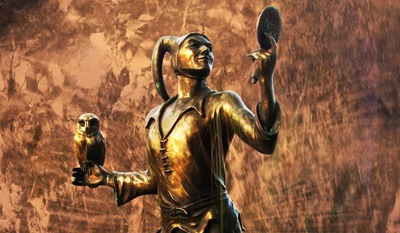 The “trickster” meme may actually stem from our very human beliefs around determinism and absolutism. We think of entities as being immutably, one thing or another. They may not have any such status in our material world. They instead may be “forms” that depend as much on our concepts of reality as they do the reality of the “others”. Think about it…. I agree with Mike Good and have been stating as much for quite a while now. There is NO question. Humanity as at the very epicenter of the UFO enigma. It exists because of us. That does not mean that men created UFOs much like the atheist argues that man created God. As Mike has stated, the human perception of the UFO phenomena has adaptively evolved to fit the social paradigm in which contact cases are documented. To understand the UFO phenomena, we MUST understand the juncture of the UFO/alternative consciousness and our perception based, possibly entrained, reality system. Again, our reality may in fact represent their “space”, or the medium through which they navigate as we experience their merger with our consciousness in any perceived UFO event. Whether that be a sighting or an actual contact experience. There is only one reason that we do not possess UFO evidence. How can we collect that which we directly hide, unknowingly? That which our physically bound and entrained senses block out in order to maintain a survival based consensus reality and it’s typically facilitative cognition. IMO, our own ongoing evolution is the answer. I have a term for what Mike describes here as the trick playing high strangeness that IMO we ourselves are responsible for amid such encounters. I call it Sentient Evolution. We are the dreamers. It’s what we do best. Again, our reality system may in fact represent their “space”, or the medium through which they navigate as we experience their merger with our consciousness in any perceived UFO event. Whether that be a simple sighting or an actual contact experience. Fascinating discussion, Mike & Jeff. There’s definitely a very important component to the mystery hidden inside human consciousness. In the end, that might very well be the mythical ‘missing link’ for a UFT (Unified Fortean Theory) that some researchers have sought. Adequate evening! News describing my at liberty is literally completed, proceed to journey implementation.